I am always excited to learn about something new in my hometown and earlier this summer some good friends invited us to their daughter’s first birthday party where we discovered D.C.’s Yards Park. I am a huge fan and am doing my best to spread the word about this new treasure in the city! Yards Park is located near the National’s baseball stadium. The Navy Yard metro stop is within walking distance and although there is street parking available, save yourself the hassle and hop on the metro. Click here for a metro map. Whether you’re looking for a picnic spot, want to let your kids run through a fountain, watch an outdoor movie or listen to live music, this spot has it all. 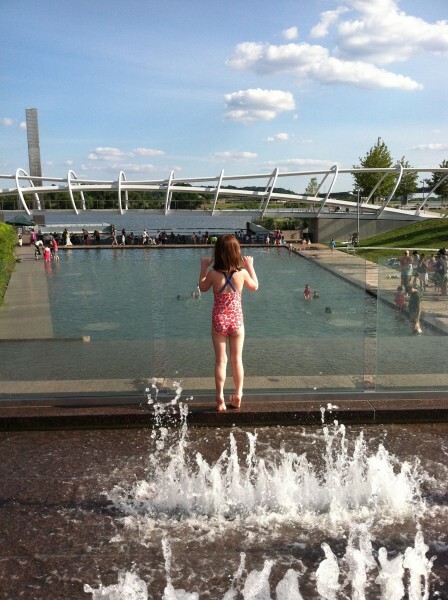 Yards Park sits on Washington’s other river, the Anacostia River and is a great mix of serene gardens, a walking path along the river and a huge wading pool complete with fountains and a waterfall for the kids. In addition to the great green space and the water, there are free outdoor activities throughout the year. Click here for a full schedule and start times. There is a lunch concert each Wednesday through September 5th located at The Fairgrounds on Half Street, SE across from the Navy Yard metro station. Click here for more information. Another fun lunch time activity in the area is the Truckeroo Food Truck Festival held every Friday starting at 11:00 am, also at The Fairgrounds. Food Trucks are a recent phenomenom in D.C. and each Friday some of the most popular gather at the Fairgrounds for a street party of sorts. There is an outdoor movie each Thursday located at the corner of New Jersey Avenue, SE and Tingey Street, SE on Tingey Plaza. Tonight’s movie, Muppet Treasure Island, is the last movie for the summer, but if you’re planning a trip to D.C. next summer be sure to check the calendar for upcoming movies. Keep in mind the Thursday movies, although geared towards families, start at sundown or approximately 8:45 pm. This activity may be better for older kids, dependent on bedtimes or just how much your child can sleep through. 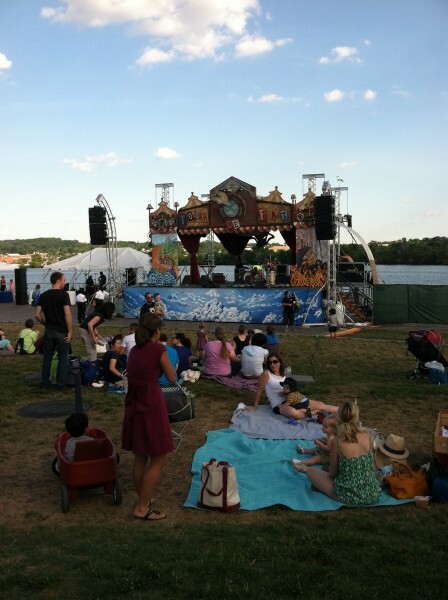 The concerts on Friday evenings are located along the Anacostia River, just off Water Street. Click here for a map. Concerts run through September 14th. You can pack a picnic or take advantage of the food provided by Red Apron Butchery, Buzz Bakery, ChurchKey, Luke’s Lobster, STIX and BBQ Bus. If you decide you want to pack a picnic these three grocery stores/markets on Capitol Hill will be the most conveniently located: Eastern Market, Yes! Organic Market and Harris Teeter. Eastern Market and Yes! Organic Market are both located at the Eastern Market metro stop and Harris Teeter is located one stop further at the Potomac Avenue metro stop. All three are on the Orange and Blue line. Click here for a metro map so you can plan your trip. 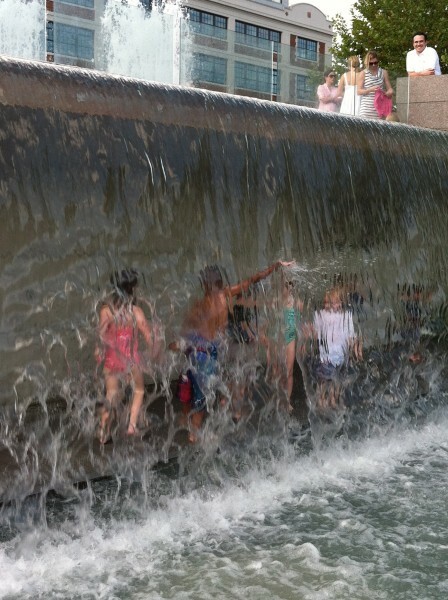 Yards Park is a hopping spot in the summer. 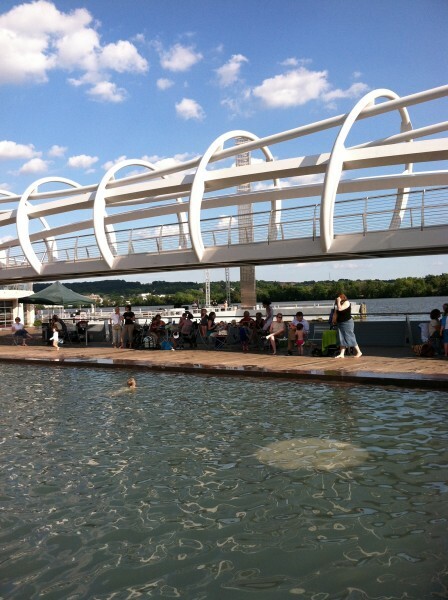 Check their calendar before your trip for upcoming events and even if you’re visiting D.C. during another season Yards Park is still a must do. DC is home to the winning Washington Nationals and the Nat’s stadium is located in a great newly revitalized area of the city. 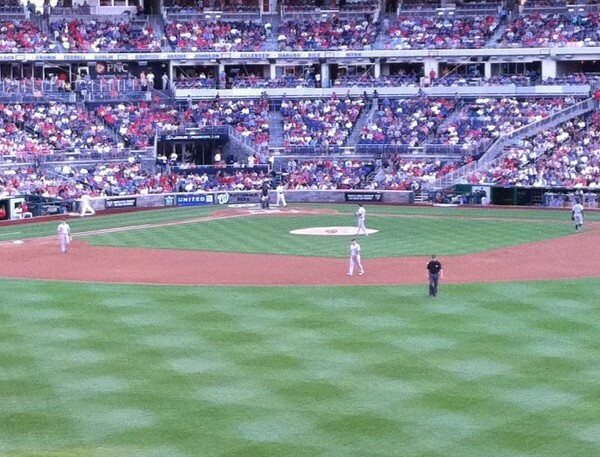 When the Nats are at home grab a ticket and take your kids out with the crowd! To get there it is best to take the metro to the Navy Yard station located on the metro’s Green line. For more information on navigating the metro click here. Parking passes are often for sale on the Washington National’s website along with tickets. Click here for the Nats website. If you decide to drive and park keep an eye out for the pedicabs (or rickshaws) around the stadium and hop on for a short ride. 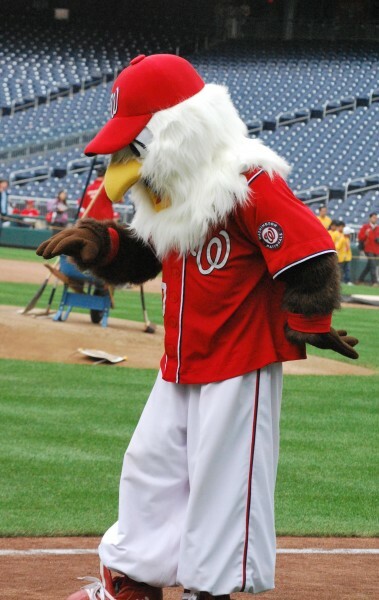 In addition to the actual baseball game and the required popcorn and cracker jack, Nats stadium has a Build-a-Bear workshop where you can build your own Nats mascot, Screech the Eagle, and a playground. Both of these are located near the stadium’s main entrance. 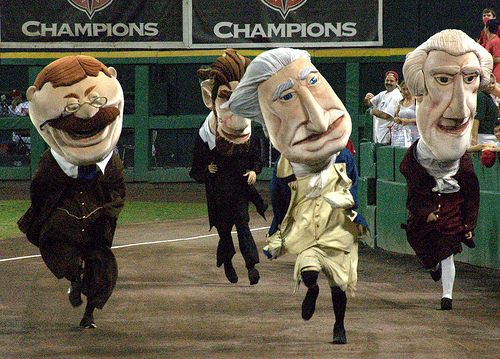 Be sure to be back in your seats for the fourth inning when you’ll see the very popular President’s Race. 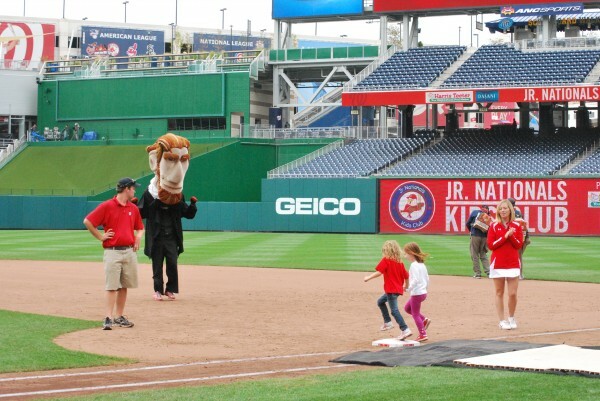 Four mascots representing Presidents Washington, Jefferson, Lincoln and Teddy Roosevelt race against one another in a hilarious lap around the field. Click here for more information about the tradition and get ready to cheer for poor Teddy, who has never won a race. The best kid’s activity at the ballgame is the running of the bases, which kids can do after Sunday home games. Click here for a schedule. All kids ages 4-12 can participate and my advice is to line up during the 7th inning. 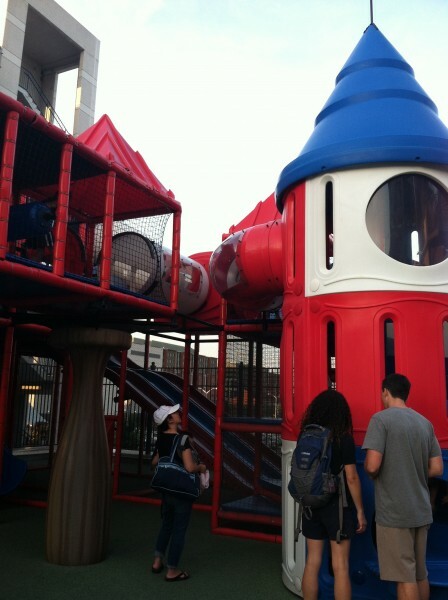 The line begins on the steps to the left of the playground. Don’t be intimidated if the line looks long, once the kids start running it moves very quickly. And what a thrill to run the bases on a real baseball field! Just outside of the ballpark, the Fairgrounds hosts a Family Carnival on Sundays from 11:30 am until 2 hours after the game. This open air venue is located on Half Street, SE. You’ll find mechanical & inflatable rides, games, children’s activities and adult diversions. If you’re looking for dinner after a game, hop on a pedicab and head to near by Barrack’s Row on 8th Street, SE where you’ll find a variety of family friendly options. Click here for a complete list of restaurants. Two of our favorites are Ted’s Bulletin and Matchbox Pizza. The Eastern Market metro stop is near by so you can head directly back to the hotel after dinner. A day at the ballpark promises to be a fun adventure for the whole family and I bet you have no trouble getting the kids to sleep at the end of the day. As you begin to think about a family trip to DC, the first call you should make is to your member of congress as they have a limited number of tickets to select sites that they are able to make available to their constituents. Each Congressman and Senator has a staff person in DC available to help you avoid the lines and gain access to some of the best sites in the city: The Capitol, White House, Bureau of Engraving and Printing, the Library of Congress and the Supreme Court. First, how do you find your member of congress? Visit the House of Representatives and Senate website and type in your home address to determine your Congressman and Senators (Short civics lessons, you have one Congressman and two Senators). Visit their personal website, as most members of congress dedicate space to giving you information about tours, and call the office to let the staff know you’re coming. So what specifically can members of congress help you with?